Ubuntu isn’t exactly a stranger to the mobile space — it started showing off its Ubuntu for Android project in early 2012, but it wasn’t about to stop there. Not long after teasing the prospect of a touch-friendly future for its peculiarly-named OS, Canonical has officially pulled back the curtains on its Ubuntu phone OS and it looks, well, great. That beauty comes from the fact that it doesn’t really look like any other mobile UI out there right now — it eschews the traditional app grid concept that pervades iOS and stock Android and instead relies on horizontal swipes to view oft-used applications and switch between currently running ones. In a way, it’s approach is more reminiscent of Windows Phone 8 and Windows RT than either of the two leading mobile OSes, though whether those UI decisions catch on is another story entirely. Still, the end result is an interface that feels more spacious and expansive than its potential rivals, a tricky proposition when hardware designers struggle to balance device screen size and portability. Plenty of sweat has been poured into the crafting of Ubuntu’s search functionality as well, and it’s mildly reminiscent of Palm/HP’s webOS. A single search query will yield results from multiple sources, and Ubuntu is apparently clever enough to determine which of the results are most likely be what you’re looking for. Throw in support for robust voice commands and the ability to play nice with HTML5 apps as well as native ones and you’ve got yourself one intriguing little product. Now, a new mobile OS is swell and all, but it’s nigh useless without some proper hardware to go with it. Unfortunately, that’s where the situation gets a little stickier — Ubuntu Mobile is designed to play nice with hardware of all stripes (it supports x86 processors in addition to more common ARM chips, and doesn’t lean on a Java Virtual Machine), but there hasn’t been any word yet on device partnerships. 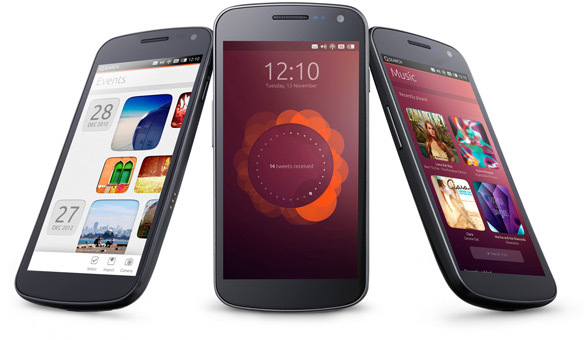 Instead, Canonical founder Mark Shuttleworth has pointed out that first Ubuntu-powered phones could see the light of day towards the end of this year or in early 2014. Of course, Ubuntu’s latest mobile foray raises some weighty questions, not least of which is “who would buy an Ubuntu phone?” If Canonical CEO Jane Silber is to be believed, Ubuntu’s appeal isn’t just limited to Linux enthusiasts and enterprises. Instead, We also see an opportunity in basic smartphones that are used for the phone, SMS, web and email, where Ubuntu outperforms thanks to its native core apps and stylish presentation.” The ability for OEMs and carriers to easily modify and rebrand Ubuntu on mobile devices certainly doesn’t hurt — Firefox OS has taken a similar route with carrier partners like Telefonica. What’s really got me scratching my head is how Ubuntu will stack up against its rivals (and there are plenty of them). I don’t need to tell you that Apple and Google are running the smartphone show with their respective mobile operating systems and the list of players extends much further than you may expect. Windows Phone 8 and BlackBerry 10 have probably raised the most eyebrows lately, but the teams behind Tizen, Firefox OS, and Sailfish are gunning to make their mark on the mobile space all the same. Shuttleworth was honest that the smartphone OS market is already a crowded space, but feels confident that the Ubuntu story will present a winning proposition. Canonical can’t compete with the millions of dollars spent by Microsoft and RIM, but can compete, according to Shuttleworth, on a classy interface across all segments of phones. Here’s hoping it works out — I can’t help but feel that the Ubuntu approach is too interesting for people to ignore completely.